Sessions with Judy at the ceramic shop continue and we are having fun and being productive. Part of the enjoyment is not knowing exactly what you have until it is fired and you pick up your piece to take it home. They have samples of the various colors of glazes, paints, etc. but as they are applied they don't look like they will after firing. Here's an example. 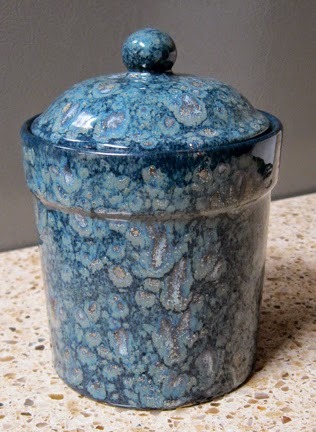 I chose this canister and applied glaze and then the color crystals (those bumpy bits). 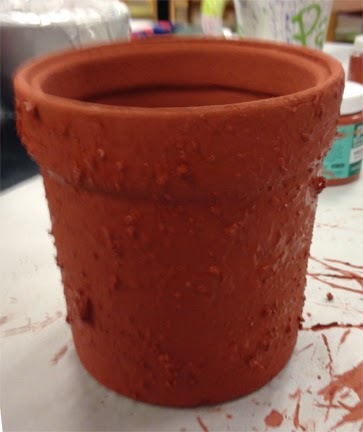 Looks like it will come out terra cotta but instead . . .
. . . . it looks like this! Great golly, who would have thought it? Nobody! That must be one amazing place! Wow. It turned out totally different but beautiful.